How do I email a list? How do I reorder items in a list? How do I clear check marks? How do I delete list items? How do I delete multiple list items? I misspelled an item and now it is included in the item database. How can I get rid of it? Why do the items in the item database have a plus symbol on their right side? Why do some items appear automatically when I enter the add item screen? How can I search the database for items to add to my list? What's the difference between the free version and the ad-free version of the app? Emailing a list is easy. Simply tap on the list header (the area of the list which contains the list title) for list specific options and choose 'email list'. 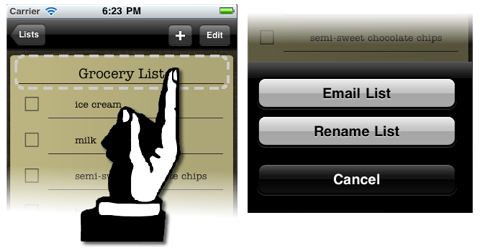 If your email is configured on your device, a new message will automatically be populated with your list items. Swipe across the list cell while on the "Lists" screen. When the delete button appears on the right side of the list cell, tap it to delete the list. This action cannot be undone. While viewing your list, tap the edit button. Reordering controls will appear on the right side of each list item. Drag your item up or down to the desired position. You can check and uncheck items on your list by tapping on the check box on the left side of the item. You can also clear all of the check marks at once by tapping the edit button followed by the trash can. You will be given the option to clear all check marks. While viewing your list, tap the edit button. Delete controls will appear on the left side of each item. Tap the control followed by the delete button. Alternatively, you can delete individual items without going to the edit screen by swiping the item. When the delete button appears, tap it to finish deleting the item. While viewing your list, tap the edit button followed by the trash can. 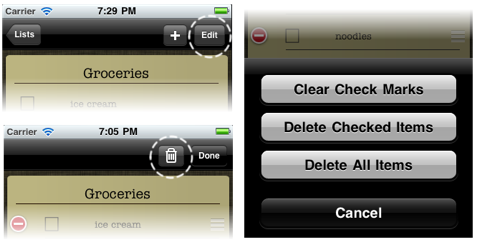 You will be given the option to delete only checked items or all of the items in the list. Items can be deleted from the item database by swiping across the item and selecting delete while on the item add screen. You can speed input by tapping on the plus symbol. The item will be immediately added to your list. This is handy if you don't need to edit the item name before adding it. 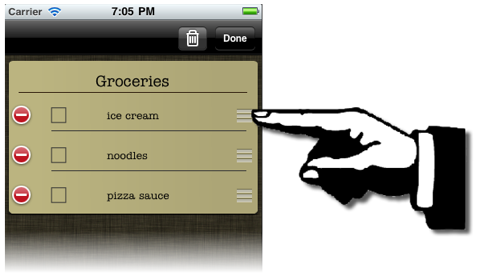 Simple Grocery List keeps track of how often you have added items to your list(s). It presents items used most when entering the add item screen. The database is searched automatically as you start typing the name of the item you are adding. When you see the item appear on the top portion of the add item screen, tap it to add the item name to the edit field. You could also just tap the plus icon to add it immediately to your list. If the item you are wanting to add to the list is not contained in the database, just finish typing it in the edit field. It will be automatically added to the item database. 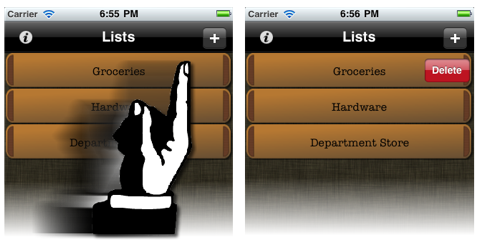 If you upgrade Simple Grocery List to the ad-free version, you will no longer see ads displayed from third parties. All other portions of the app remain the same.